Salmon is always delicious, but its light, pink flakiness seems particularly perfect this time of year, perhaps poached in butter or grilled with some teriyaki sauce. But what if we added a fruity relish? Or some citrusy marinades? To expand our salmon palette this year, we turned to some experts (and ourselves) to get their favorite way to prepare our favorite fish. I really love fish and especially salmon. Since it is a rich and flavorful fish, I shy away from rich preparations or too complex flavors. I really prefer to broil, grill or sauté it with salt, espelette pepper, and olive oil. Finish it with a little lemon and sometimes capers or tarragon! I like to sear it, or I cure it in salt and aromatics. Or, the Peruvian way is to just cure the slices in “leche de tigre,” a citrus-based marinade. Serving smoked salmon with beets is a nice way to trick your palate; it feels very rich though it’s very light. A lot of flavor. I wrote about how you should make gravlax at home, which has two advantages: 1) It’s way cheaper, like a fraction of store-bought prices, and 2) It tastes better, because I’m able to control my salt levels (I tend to like my gravlax on the sweeter end). Learning to make homemade gravlax has been one of those aha! moments—it’s just the better way. And it’s way easier than you’d think. When cooking salmon at home, I like to use skin on salmon fillet pan seared skin side down. Liberally salt all sides of the salmon and let it sit for 15 minutes before drying very well with paper towels. Re-season the fish just before cooking. Heat a sauté pan over medium-high heat then add a couple of tablespoons of avocado oil and place the salmon in skin side down. Carefully press down on the fillets for twenty seconds or so and then reduce the heat to medium. Do not move the fish, let it cook 2/3 of the way on the skin side before gently flipping over to finish to desired doneness. To gauge doneness, watch the opaque line creep from the bottom of the fish towards the top. Adjust heat as needed. On our annual beach vacation, my friends and I take turns cooking every night instead of going out. 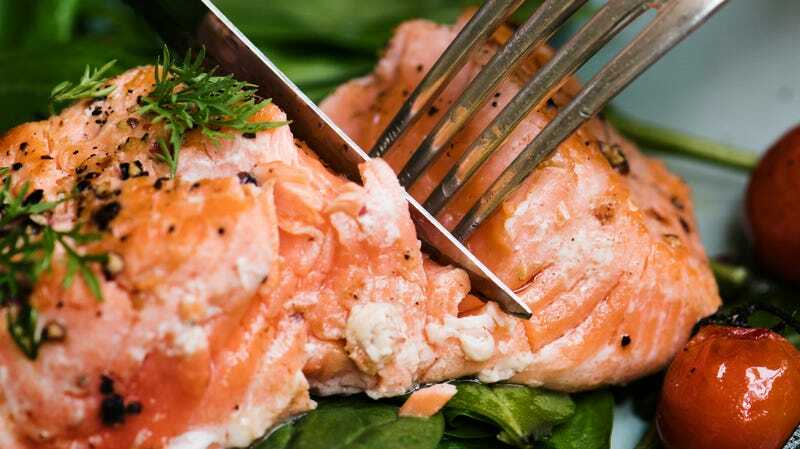 One salmon recipe has become such a huge hit, I had to ask my friend Jeanne for the recipe. She says it’s basically a bastardized version of a recipe from Bon Appetit, with the sauce ingredient amounts doctored significantly. So her perfect marinade is: 6 Tbsp. soy sauce, 2 Tbsp. sugar, 1/4 cup dry vermouth, 1 tsp. grated ginger, 1 Tbsp. lime juice, 1 tsp. wasabi (optional). Combine and then marinate 3/4 pound salmon cut into 2-inch pieces in it for at least an hour before grilling or sauteeing. Gentle sear on one side (if you are leaving skin on, sear skin side) and low and slow cook the other side. This way you get a nice crisp on one side and a tender medium rare on the other. As kids, my brother and I would beg my mom to “make” her herb-butter salmon, which actually came ready-to-bake from Costco. You can DIY it, though: I just chop whatever herbs are growing in my garden (dill, parsley, and rosemary work well), mush them around with a scoop of softened butter, roll that into a ball, and place it atop the salmon before sliding it in the oven. The heat melts the herb butter into a delicious blanket across the fish. I love salmon and as a rule of thumb, cook the salmon for 11-12 minutes per inch (thickness and not length). If I grill it, I make sure the grill is very hot. I usually use a perforated pan for fish and place it on the grill to heat. I season my salmon with only kosher salt. When I was in culinary school one of my instructors stopped me before I seasoned my salmon with pepper. He said “don’t use pepper… is there pepper in the sea”? So funny, but so true. I never add pepper to any seafood. Be generous with the kosher salt on the salmon and then place the raw salmon on the pan. Cook for about 6 minutes and then turn the salmon over to grill the other side. Grill another 5-6 minutes and remove immediately. Let salmon rest and serve. Be sure to season with salt and pepper and toss to cover before adding the dressing. Whisk together in a separate bowl before adding the salsa. Mix all ingredients together, salt and pepper to taste. Whisk together the honey, lime juice, balsamic vinegar and salt and pepper. Stir in minced mint and taste for seasoning. Pour over the salsa right before serving. Serve with fish or pork as a relish.